Forget using a plain metal towel dispenser. 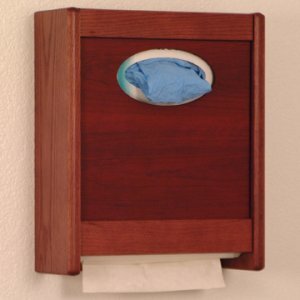 Wooden Mallet's combo towel dispenser and tissue/glove box holder adds a touch of beauty and class to your restroom or clinical setting. 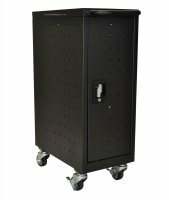 These high quality cabinets are constructed with 3/4" solid oak sides and waterproof plastic bottom panels for long cabinet life. Unit accepts most standard multi-fold and c-fold towels. Hold a variety of box sizes snuggly in place using our unique adjustable rod. Unit features an extra strong magnetic closure so you don't have to hassle with a key. Convenient front load allows for under cabinet mounting. Mount side-by-side with matching glove/tissue box holder.. Made in the USA.